The European Space Agency's newest astronauts received their awards and were named officially as 'astronauts' in a ceremony held at the European Astronaut Centre in Cologne, Germany, on Nov. 22, 2010. From left to right: Jean-Jacques Dordain (ESA's Director General), Thomas Pesquet, Luca Parmitano, Alexander Gerst, Samantha Cristoforetti, Simonetta Di Pippo (Director of Human Spaceflight), Andreas Mogensen, Timothy Peake and Michel Togini (Director of the European Astronaut Centre). It was a day of pomp and circumstance for six Europeans whoproudly received their diplomas and officially became professional astronautsin a graduation ceremony held Monday (Nov. 22) in Germany. The EuropeanSpace Agency welcomed the new astronauts into its ranks with an event heldat the European Astronaut Center in Cologne, Germany. Friends, family, guestsand members of the media were on hand to mark the official end of BasicTraining, the first phase of European astronauteducation. 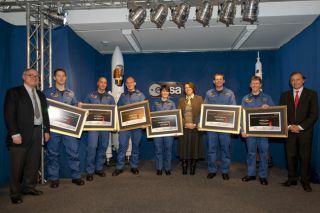 Samantha Cristoforetti from Italy, Alexander Gerst fromGermany, Andreas Mogensen from Denmark, Luca Parmitano from Italy, TimothyPeake from the United Kingdom and Thomas Pesquet from France were presentedwith certificates signed by ESA's director general, its director of humanspaceflight and the head of the agency's astronaut group. The astronauts' Basic Training covered space engineering,electrical engineering, various scientific disciplines and the major systems ofthe InternationalSpace Station and other space vehicles. They also received instruction inscuba diving to prepare for spacewalks, robotics, survival training, rendezvousand docking, and Russian language ? important for working with cosmonauts andRussian ground control partners on the space station. The astronaut candidates were originally chosen in 2009, andone of the main selection criteria was the ability to work as part of a team. "When we introduced these six new astronauts, the mostimportant part was not that there were six individuals representing five membercountries, but a team of six persons representing Europe," ESA's director generalJean-Jacques Dordain said at the ceremony. "We can't assign you all to onesingle mission, but you will all fly to space and, when you do, I hope youconsider a mission of one of you as mission of your team, too." And the time for such a mission could be just around thecorner. ESA's newest astronaut class was selected from a pool ofmore than 8,000 applicants, following an initial call for candidates from allMember States in 2008. After a year-long process, Cristoforetti, Gerst, Mogensen,Parmitano, Peake and Pesquet were invited to join ESA's astronaut group in May2009. The new astronauts will now continue with pre-assignmenttraining, and will take part in public relations activities. Once assigned to amission, they will concentrate on specialized training designed for themission.